Always forgetting something? Wish you could check your to-do list on your phone as quickly as your check the time? The tweak: LockMemos is a Cydia tweak that allows you to set reminder alerts which appear on your iPhone, iPad, or iPod Touch’s lockscreen. You can set up to four lines for reminders in Settings -> LockMemos. The reminders appear in an alert, which can also be set to activate whenever you unlock your device. Caveat: The only major limitation of LockMemos is that the reminders alerts get in the way of the Swipe to Unlock interface and need to be closed first. This may be a positive feature if you absolutely don’t want your reminders ignored–but for me it adds an unnecessary button to the lockscreen that can only be dismissed from the settings page. It would also be preferable if the list could be edited from the lock screen. Want reminders whenever you turn on your device? 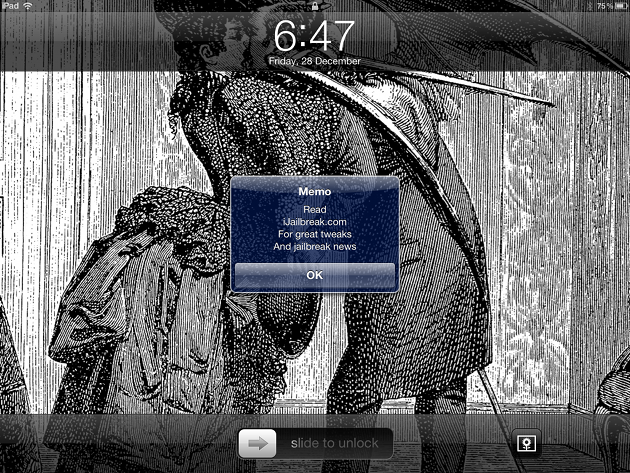 Where to find: LockMemos is available in the BigBoss repository on Cydia. While the app might not be ideal for everyone, it’s easy enough to use and is completely free. Alternatives: Aside from the default Reminders app, SBSettings‘ Fast Notes toggle is easy to access, isn’t intrusive, and can be edited on-the-fly from any screen. The only downside is Fast Notes needs to be activated from SBSettings. Alerts are easy to set, but can only be modified and deactivated from the Settings page. What do you use to create reminders for yourself? Share your thoughts in the comments section below.